The Memphis Hustlin’ Rollers kicked off its season Feb. 22 at the Pipkin Building at the fairgrounds with a bout against the Baton Rouge Red Stick, notching the team’s first win of the year. The Hustlin’ Rollers, ranked 103 in the Women’s Flat Track Derby, came out of the gate strong putting up 45 unanswered points to start the match. Memphis was assessed a penalty and had to play nine players on 10 for a few rounds allowing Baton Rouge to get back into the match. “They were playing well, but the penalty got them,” said Jennifer Smith of Memphis, one of the more than 150 fans in attendance. Baton Rouges’s momentum did not stay long allowing Memphis to score several more unanswered points. A frustrated Baton Rouge team was assessed two penalties and was forced to play eight players on 10 for 30 seconds. This made it easy for Memphis to put up 50 more unanswered points. Points are scored as the designated “jammer” for each team circles the track while passing opponents. 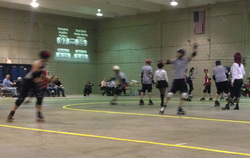 A point is scored every time the jammer passes a player from the other team. “We got them off their game, and that help put us up with a good lead,” Smith said. The Hustlin’ Rollers ended the half on top with a 128-54 lead. Each half is 20 minutes of play. The second half was similar to the first. The Hustlin’ Rollers stayed in front the whole bout, not allowing the Red Sticks to take a lead. The Red Stick, who are ranked 145th, closed the large gap halfway through first half, but it was not enough to take a lead. “I hope we look this good at the next bout,” Smith said. The final score was Memphis 246 to Baton Rouge 125. “Now we go to the after party,” said Kerry Crawford, a member of the Hustlin’ Rollers. The next home bout for the Hustlin’ Rollers is March 15 against the Charlottesville Derby Dames at the Memphis Fairgrounds at 940 Early Maxwell St. Memphis, Tenn. Admission is $10 in advance and $12 at the door.